The Qing Ming Festival and its related traditional practices are of great significance to the Chinese community. Can a Chinese Christian be involved in such a festival? How can Christians relate to Non-Christian Chinese family members on the Qing Ming Festival? 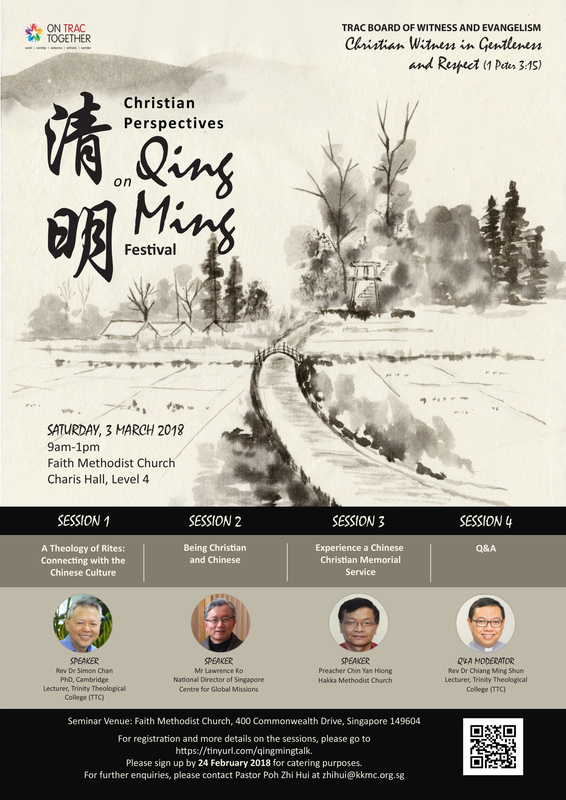 The seminar aims to provide a theological framework of remembering the dead to help Christians to be good witnesses in love and actions through understanding the ethnic culture of the Qing Ming. The talk will explore why ritual actions are important if Christians are to make connection with Chinese culture. The Chinese culture is undergirded by the Confucian ethical system which places an emphasis on relationships, especially familial relationships. The Chinese customs revolve around traditional rites which are religious but really more spiritual, as self-culitvation develops a personal selfhood which relates with family, community, nation and nature. This talk explores Chinese Qing Ming festive and ancestral rites as a basis of the Chinese familial and communal relationships and how Christians can celebrate and contribute to the evolving Chinese culture in the context of 21st C East Asian modernity. Attendees will have the opportunity to participate in and experience a Memorial Service that expresses appropriate honour for our ancestors in the Chinese culture that is shaped by and true to our Christian faith in God. To register or for more info, click here. Registration closes on 24 Feb 2018. For enquiries, please contact Pastor Poh Zhi Hui at zhihui@kkmc.org.sg.